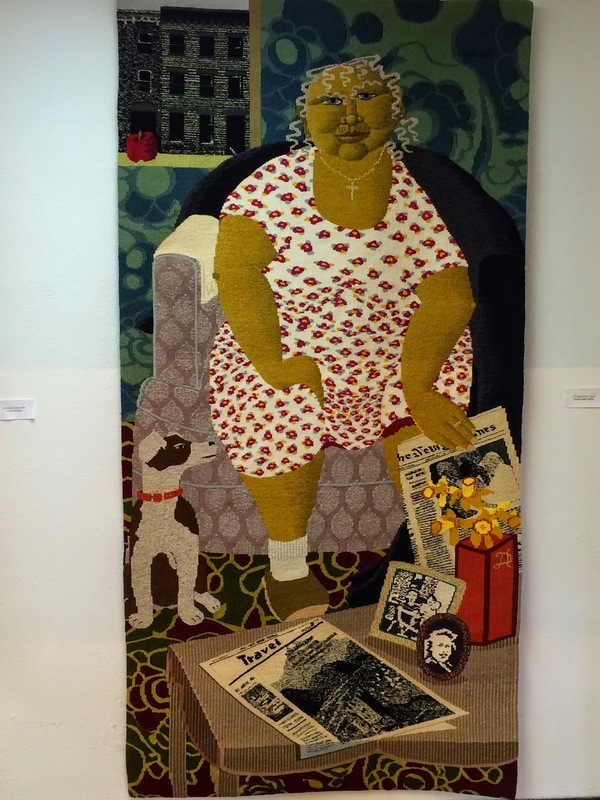 Recently I visited Southwestern Oklahoma State University (SWOSU) for a workshop, lectures and exhibit of tapestries by Archie Brennan and Susan Martin Maffei. 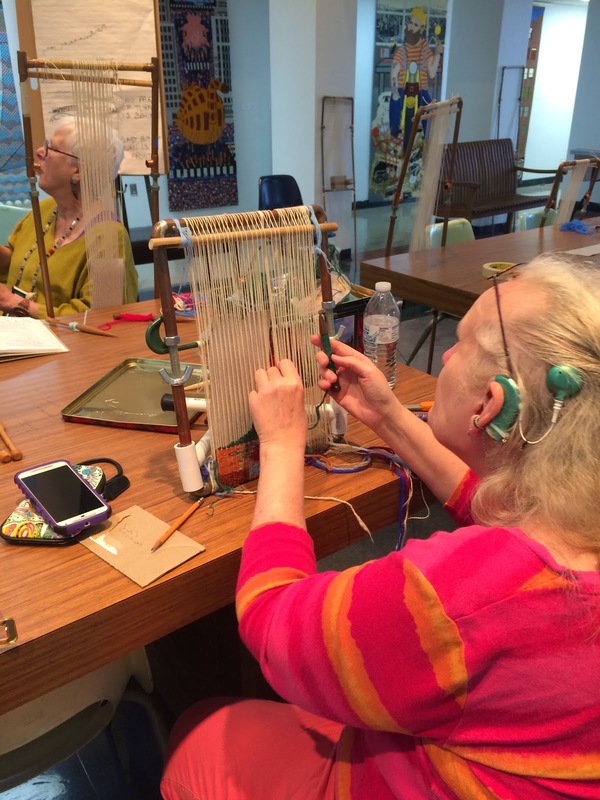 The university has been offering tapestry classes through the fine arts program and has a studio equipped with large handmade frame looms, a few multi harness looms and several copper pipe looms purchased from Archie and Susan for the tapestry classes. 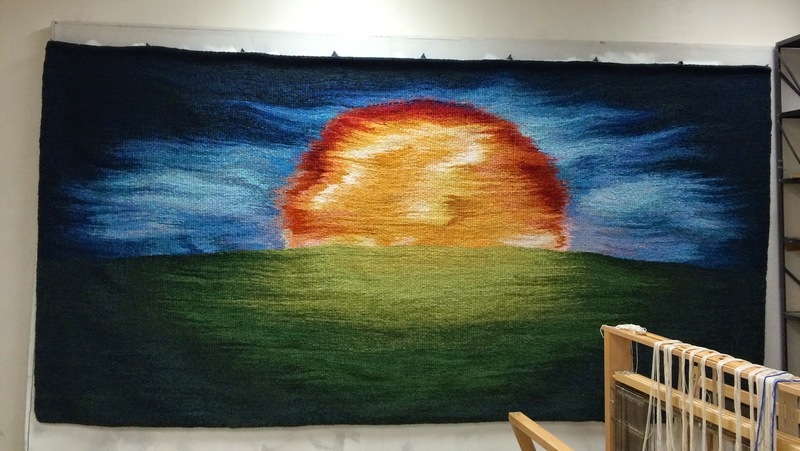 Sun On Earth, their community tapestry shown above, fills one wall. 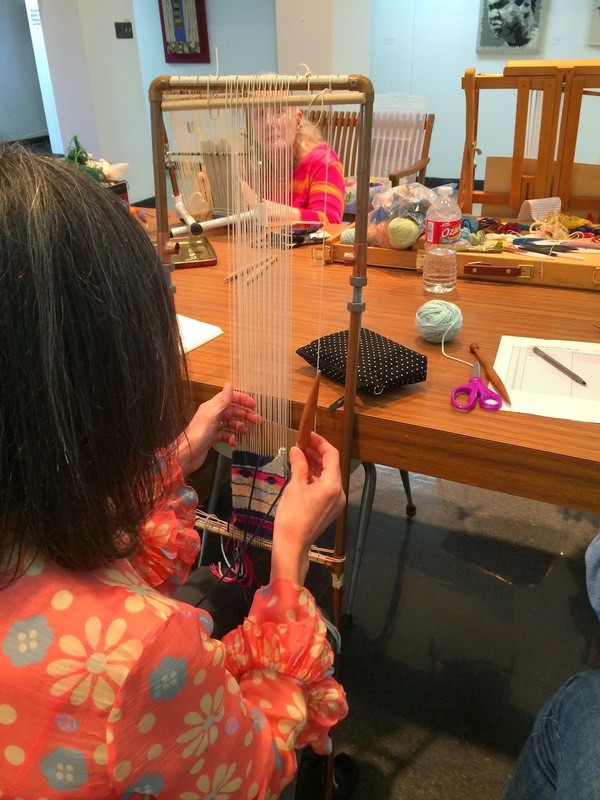 Under the direction of EK Jeong at the university a group of five weavers who didn't know each other previously have met together to learn tapestry weaving and share in the weaving of this community tapestry project. 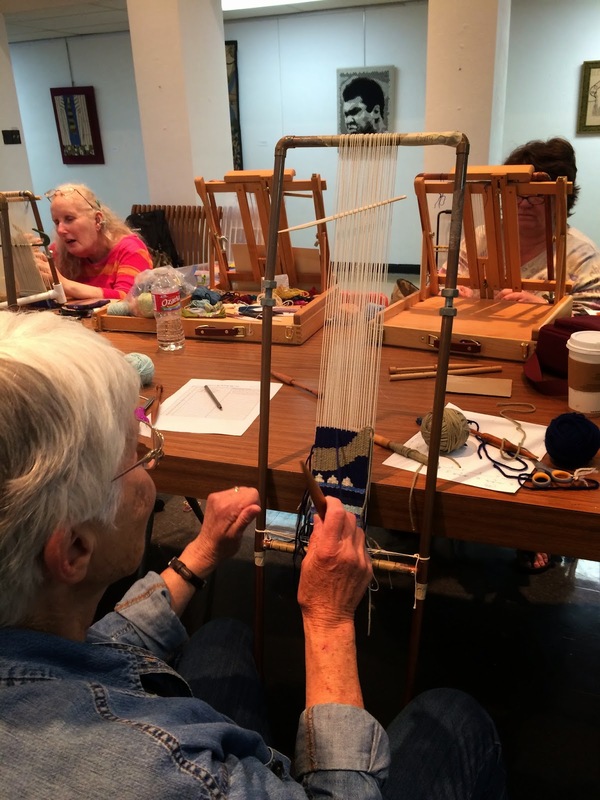 Mary Segal, Myra Jennings, Cristina Stone, Carol Goyer and Melaine Campbell continue to meet together to work on tapestry weaving and I was fortunate to meet most of them at the event in April with Archie and Susan. 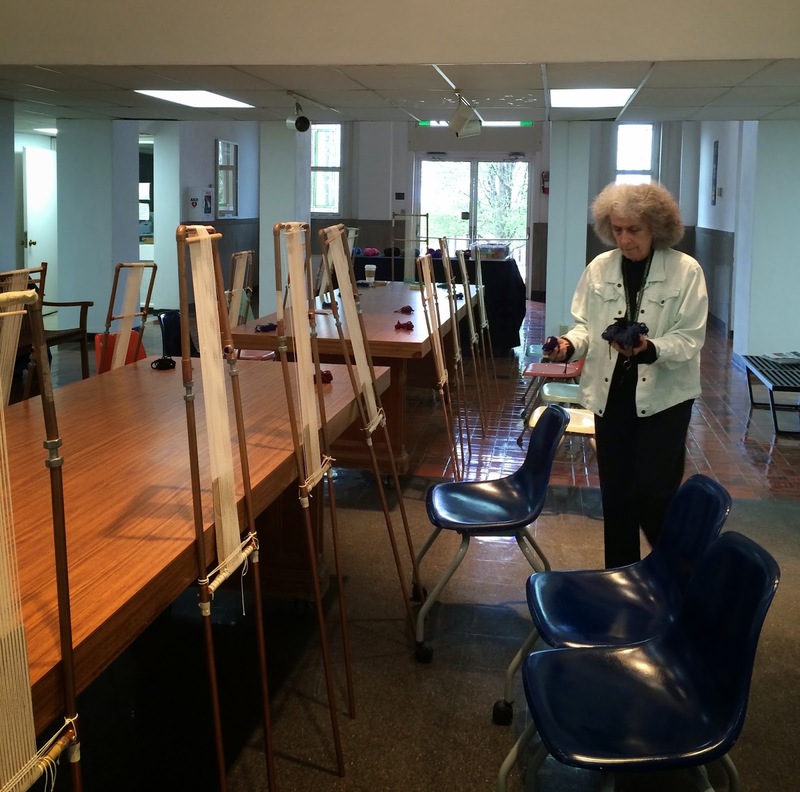 Early on the morning of the first day I met Mary Segel while Susan and Archie were setting up the main room of the art building for the workshop. 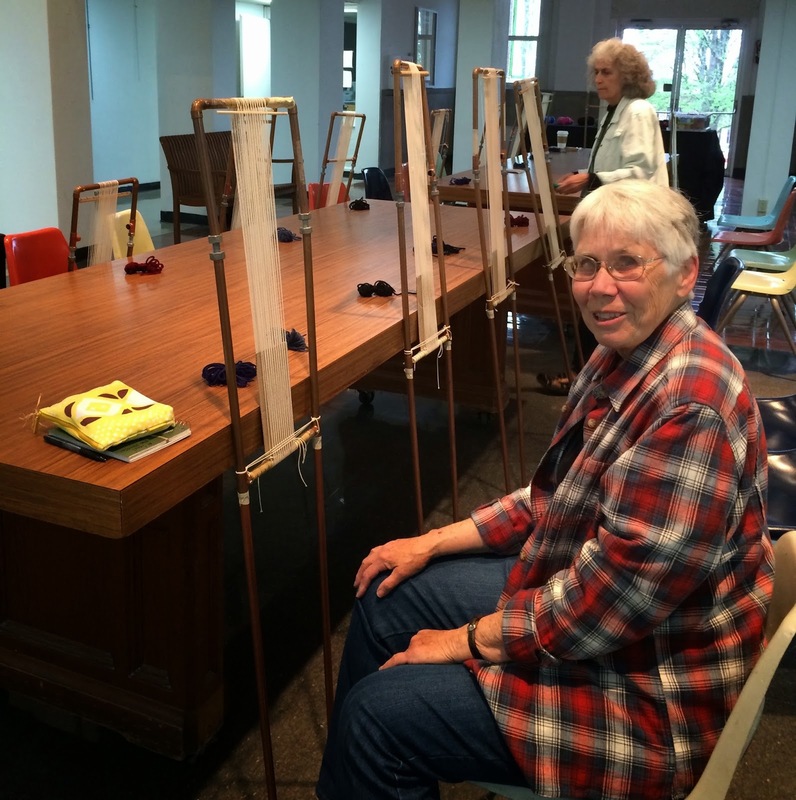 Susan and Archie brought 18 copper pipe looms with them to Oklahoma and set them up for the Monday morning workshop. 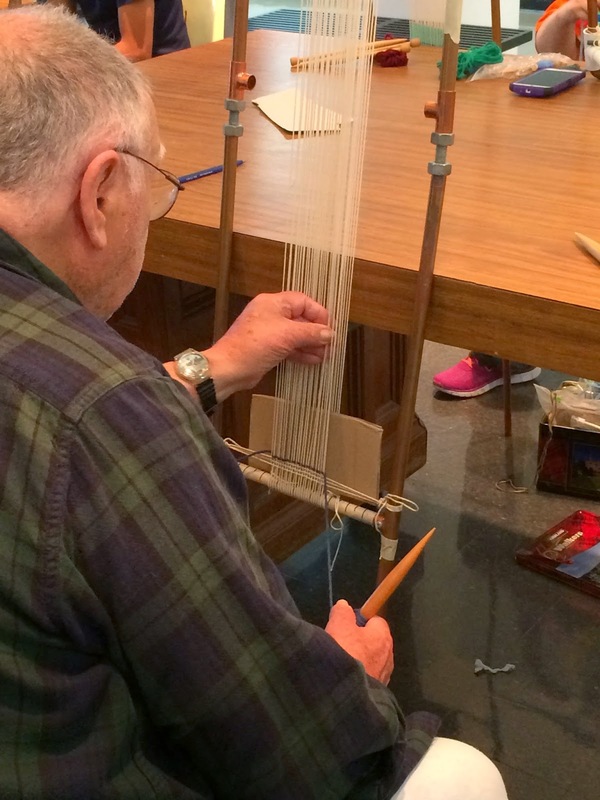 Here is Archie setting up a loom as students begin to arrive. Soon the room was full of a mixture of college students, the community tapestry group and several others who like myself came from out of town to have the opportunity to study with Susan and Archie. 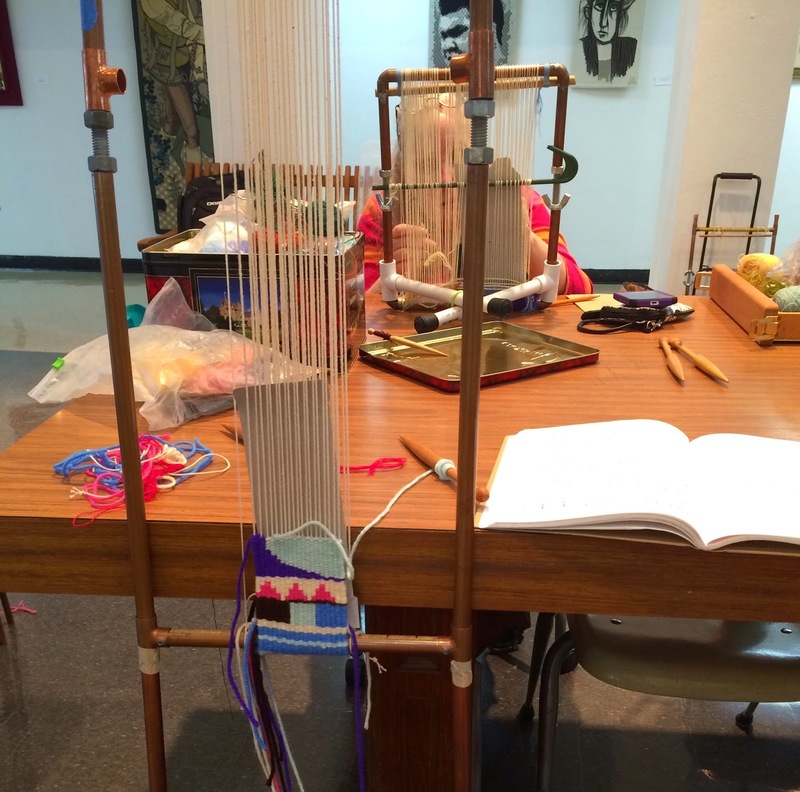 We started with setting up the looms for weaving with double half hitches and some basic techniques like stripes, starting and ending threads and color changes for the first day. In no time the room was full of students with Archie and Susan providing a lot of one on one instruction. 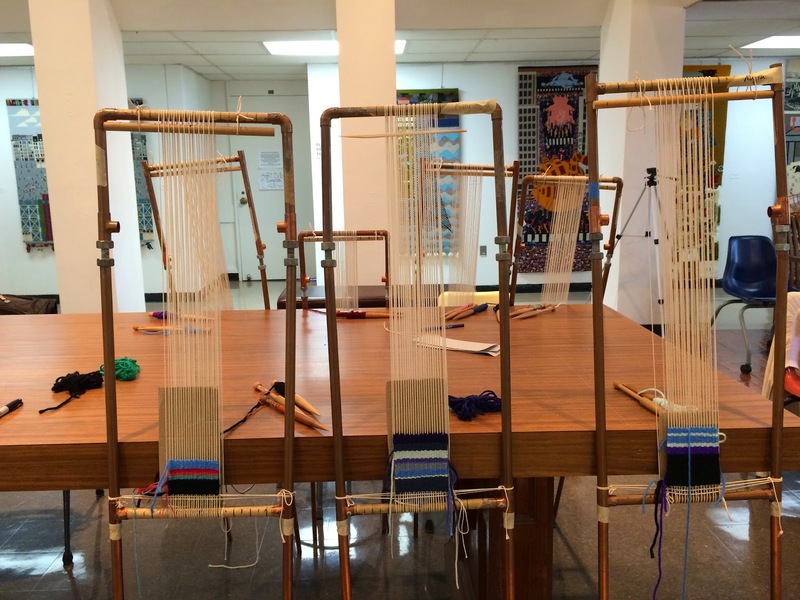 Here are some of the looms after the first day of weaving. By Tuesday the tapestries that Susan and Archie had brought filled the room and transformed it. 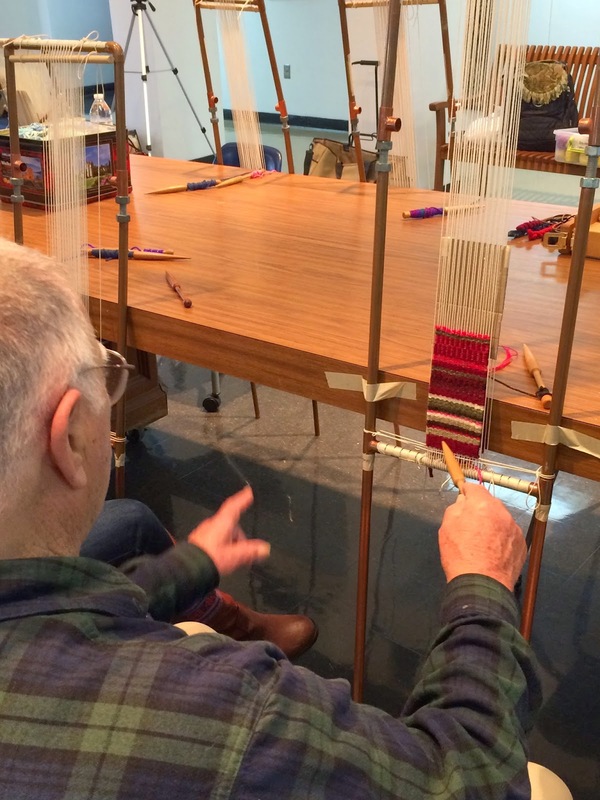 Archie gave a lecture about his lifetime of weaving adventures. 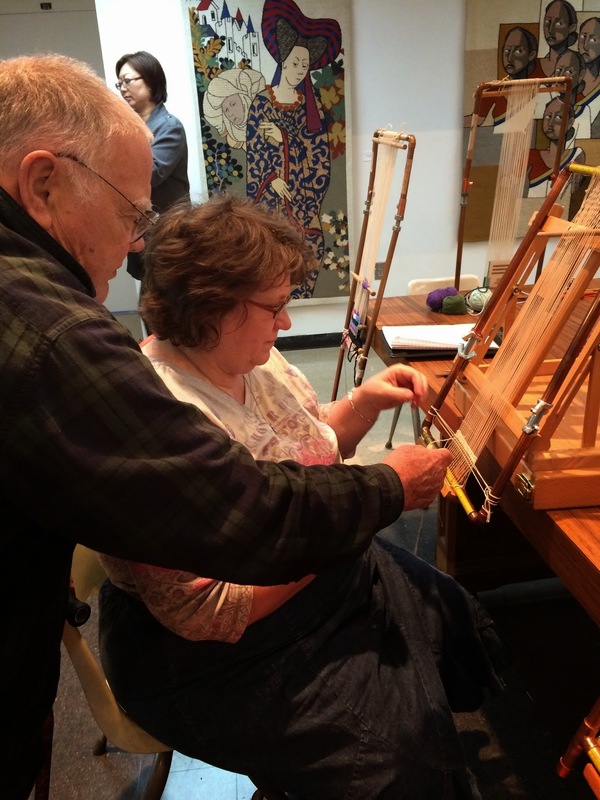 It was fascinating to hear about his long and distinguished history of tapestry weaving. I came in early that morning so that I could study the tapestries that I had only seen previously in photos and take some photographs. My photos do not do them justice but I particularly enjoyed studying the pattern weaves, interesting fibers and subtle detail in all these tapestries. It was fascinating to hear them speak of the stories behind the individual pieces also. 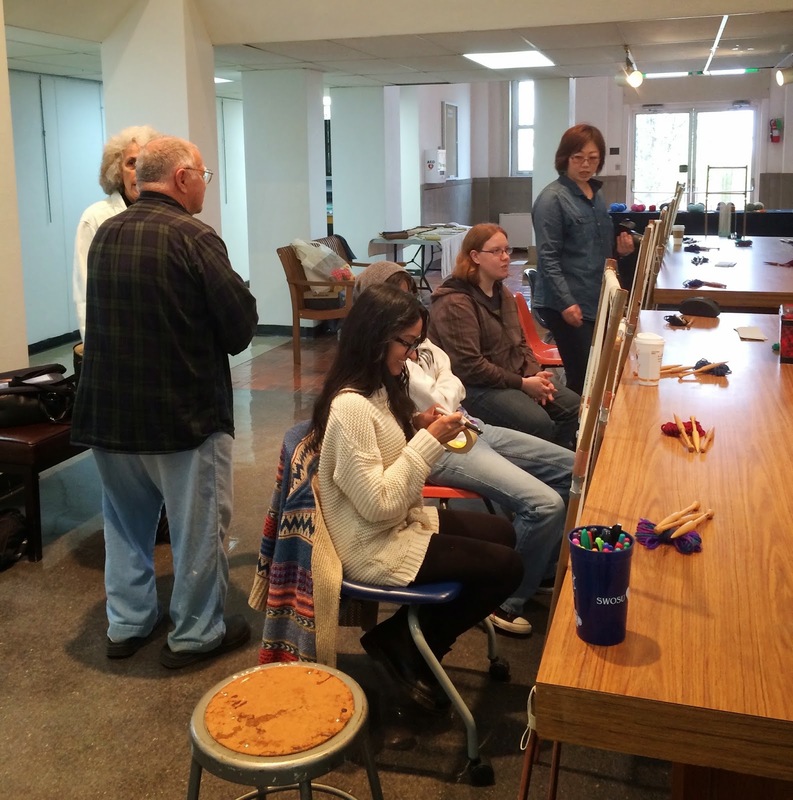 Tuesday evening was the opening reception for the exhibit. 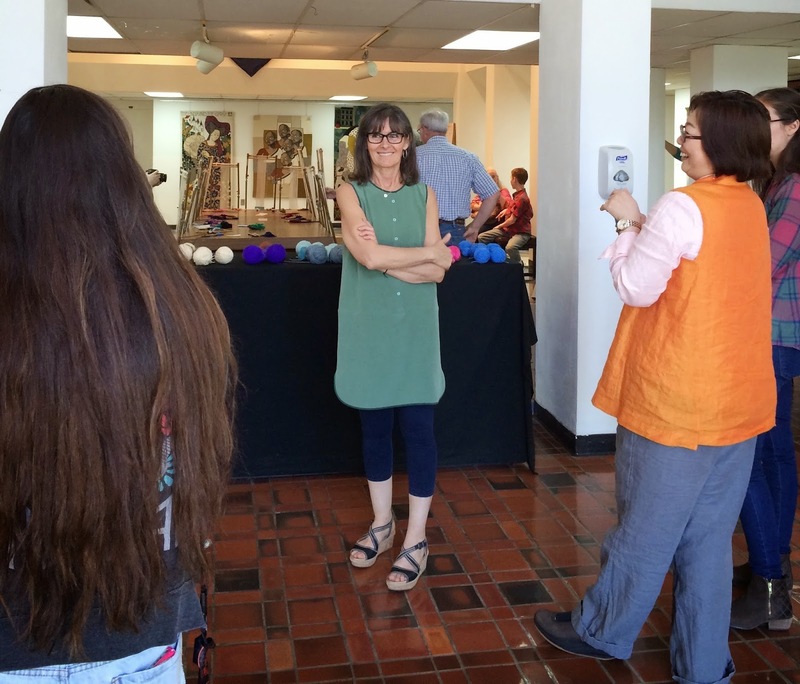 Cristine Stone, one of the community tapestry weavers is here in the center and to the right is EK Jeong the director for the project. I was able to meet a Facebook friend, Pam Patrie. Here she is with Susan at the opening. 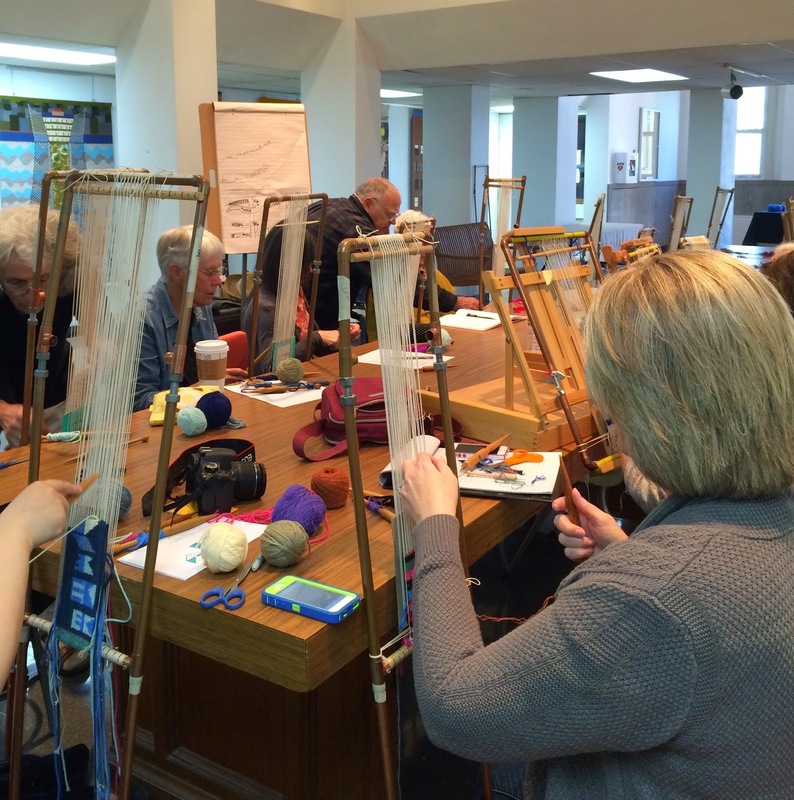 On Wednesday lessons continued and the looms were filling up. 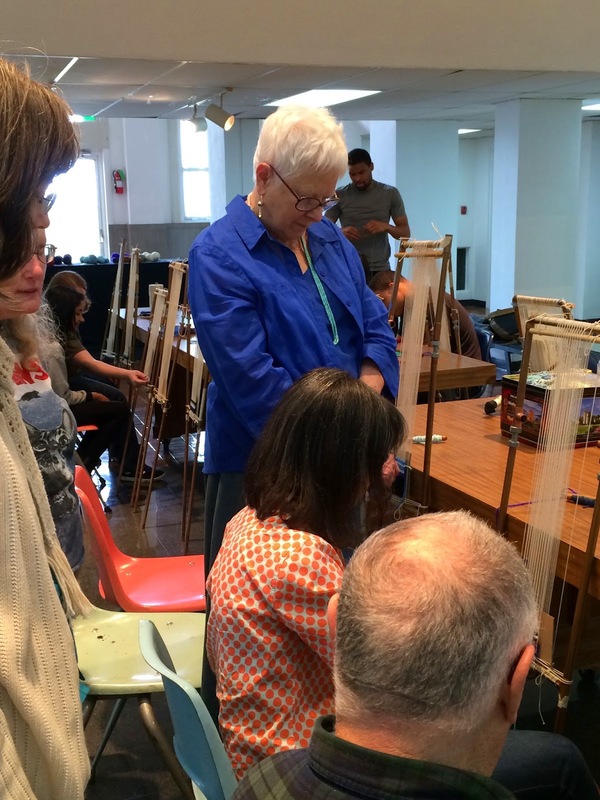 Here is Myra Jennings (in blue), one of the community tapestry weavers looking on as Archie explains a technique. 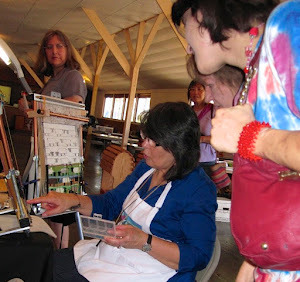 Jessica Ostrow came from Texas for the week of tapestry with Susan and Archie. I had been taking my loom back to the room with me and weaving in the evening so by Wednesday I was ready to start on another loom. This is the first little tapestry I wove during the workshops. On Wednesday we started to work on shape making with squares and rectangles and on weaving angles. We ended on Wednesday with lessons on keeping the sheds moving in the right direction while building individual shapes. 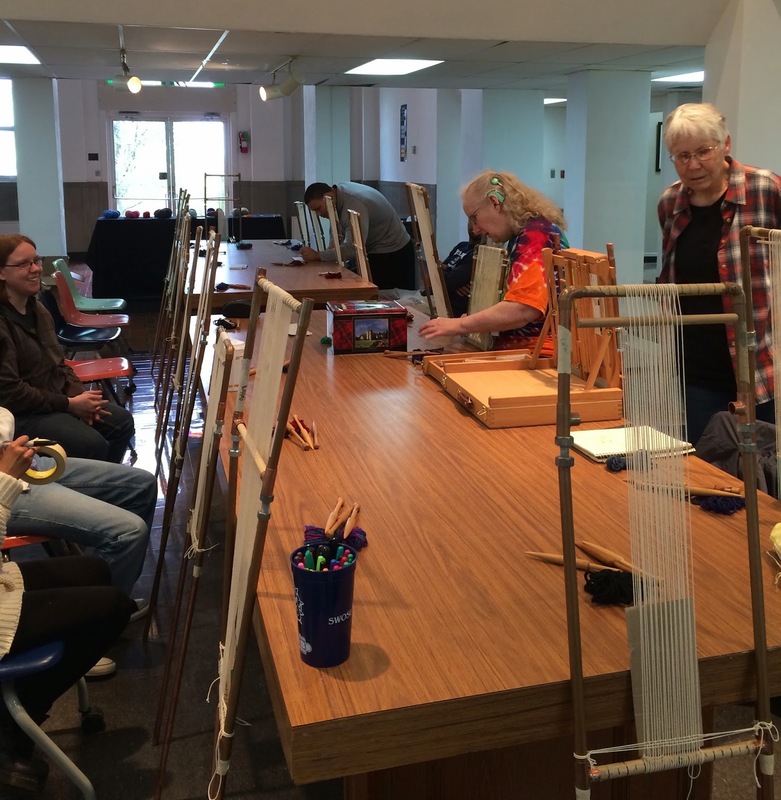 Here ia a photo from Wednesday with Carla who works in the office of the art building and the blue tapestry is being woven by EK Jeong who was working out some initials for her tapestry sign. On Thursday we enjoyed another lecture, this time by Susan. 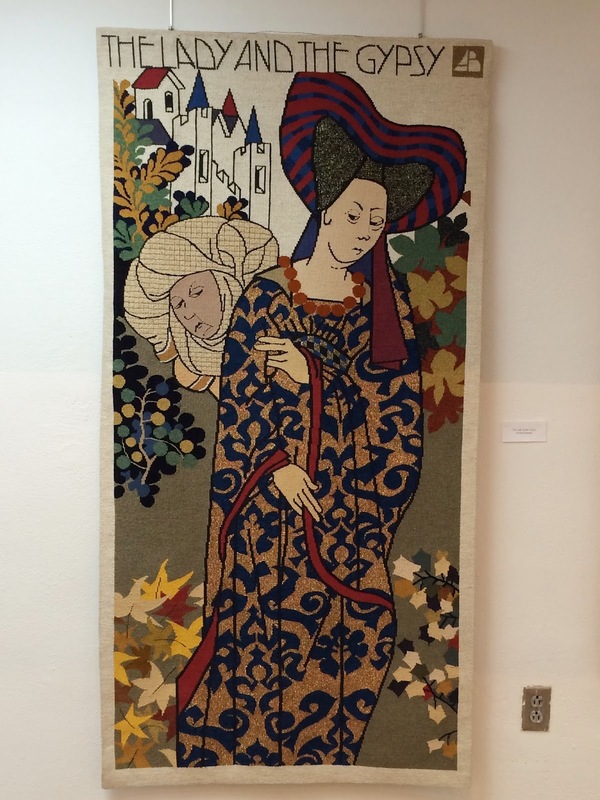 She spoke of the personal narrative content in her work and shared some of the stories woven into the tapestries she designs. 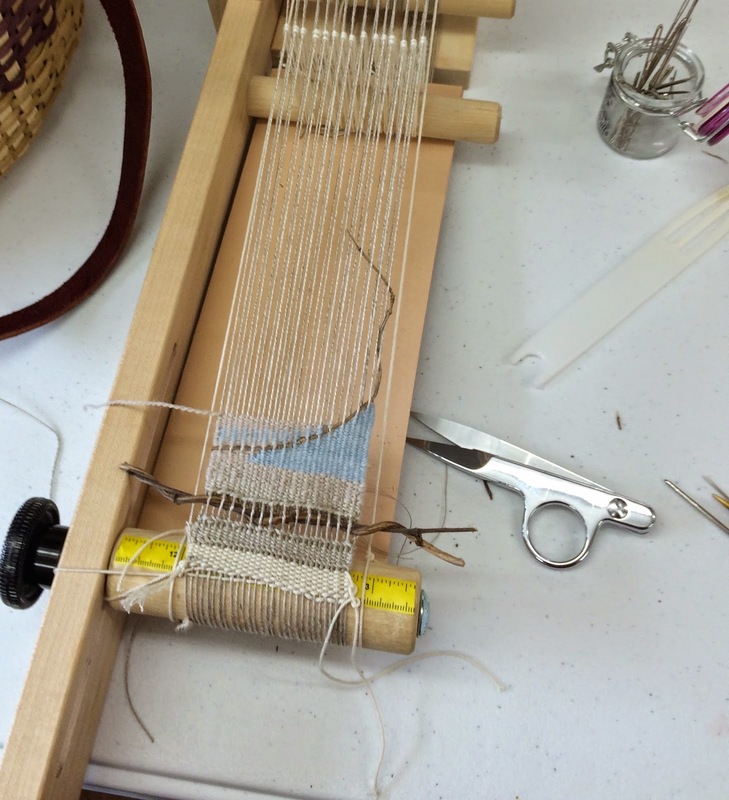 She also shared a bit about her process and how her designs develop on the loom. 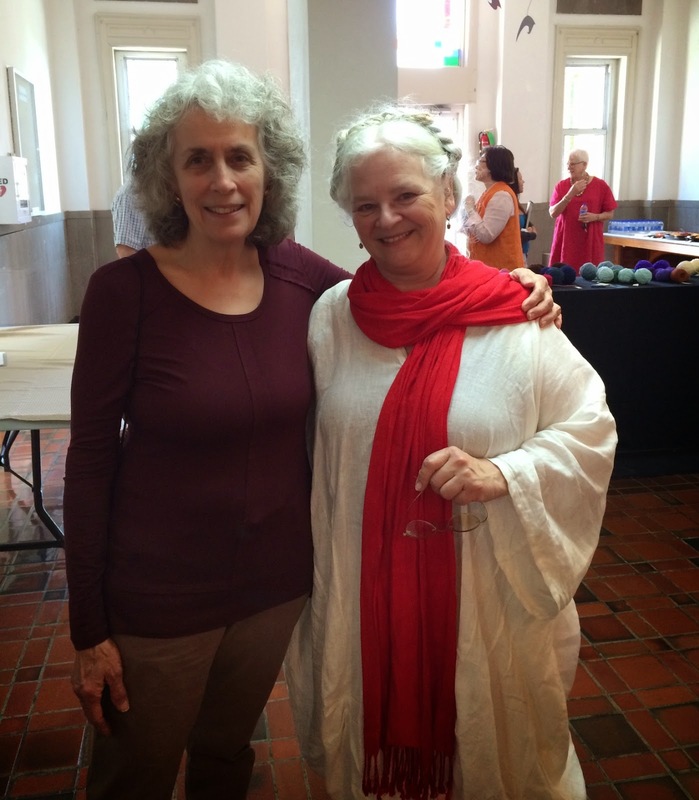 By Friday my friend Ann Schneider had arrived from Tulsa and we were working on curves. Here she is getting some instruction from Archie. and Cristina Stone, another of the community tapestry weavers. Curves were popping up all over the room. Here is my number two tapestry from Wednesday and Friday with the shapes, angles and curves. 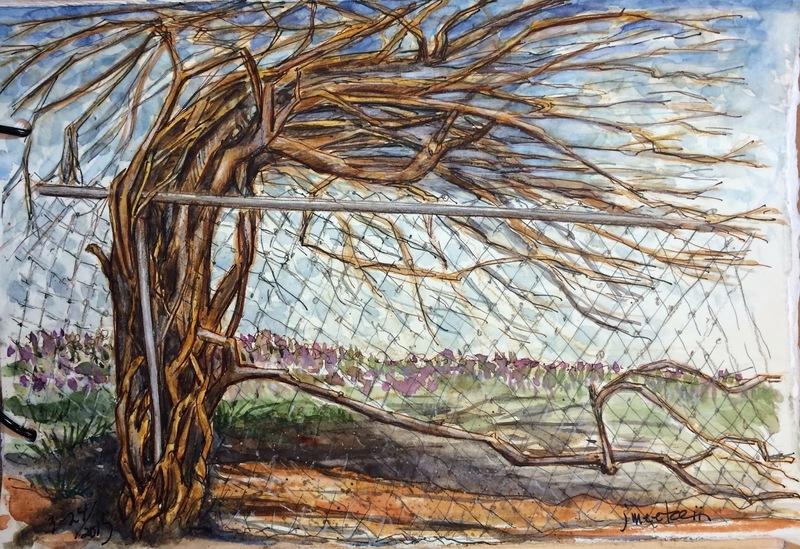 My two samples will serve to recall fond memories of a week of tapestry in Weatherford, Oklahoma with Susan Martin Maffei and Archie Brennen. My sincere thanks to EK Jeong for creating this opportunity by securing the funding and bringing them to Oklahoma. What a great time! 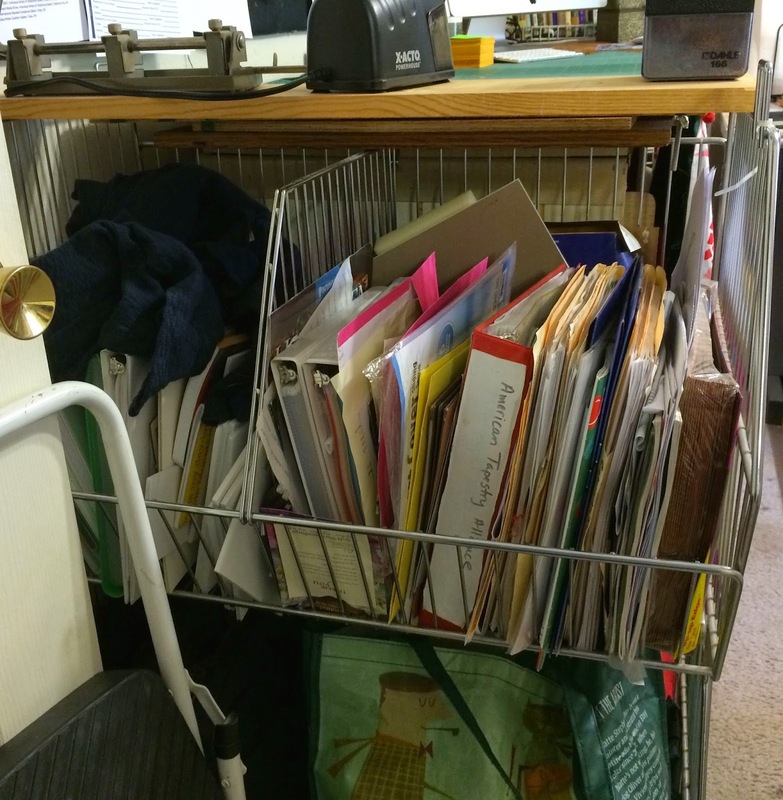 Once I returned home the bubble had burst and I found I had a long list of things that all needed to be taken care of immediately- back to the real world. Now that things have settled back to the usual busy I am working on my daily tapestry. Here is a current photo. 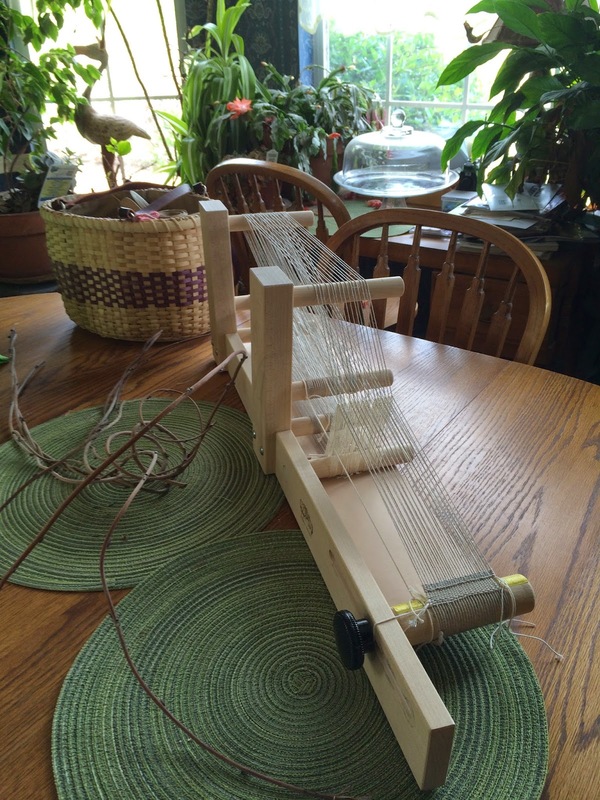 Right before I left for the workshop I had seen Janet Austin mention the possibility of tapestry on an inkle loom and once my list was taken care of I decided to give it a test and I warped my inkle with 8/2 linen. I have been fascinated with vines ever since I spent an afternoon in March drawing a detailed sketch of one of my Trumpet vines. 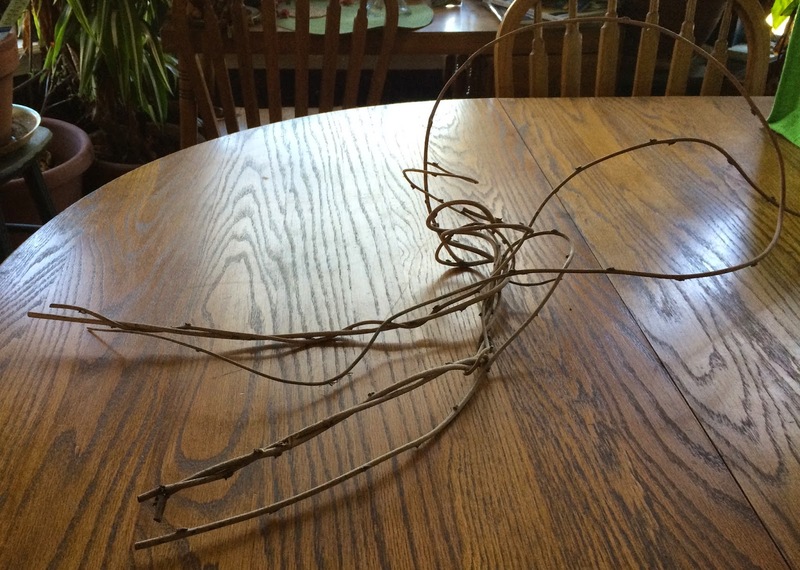 So I trimmed some Honeysuckle vines and started to incorporate them in the weaving. This is set at about 11 threads per inch and I don't know where I am going with it exactly but perhaps some Honeysuckle leaves and blooms will appear as the Spring turns into Summer. 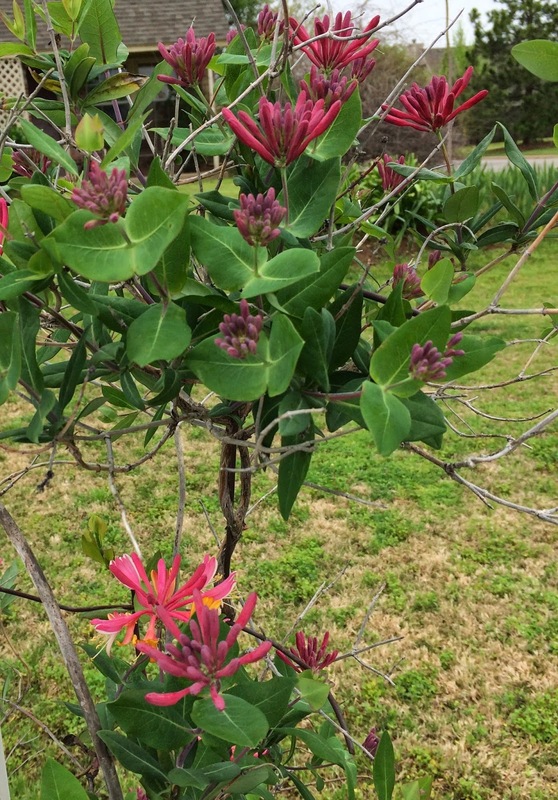 One of my Trumpet Honeysuckle is already in bloom and so my inspiration is all around me. After a flurry of finishing projects it was time to get down to some cleaning up in the Fiber Studio and also the one in my home. Red Dirt Days is hanging on the wall and Hands On is at the framers so for the past three days I have been working on creating some order in both my work spaces before the next projects begin. Always at the back of my mind is the new loom that should be arriving soon. 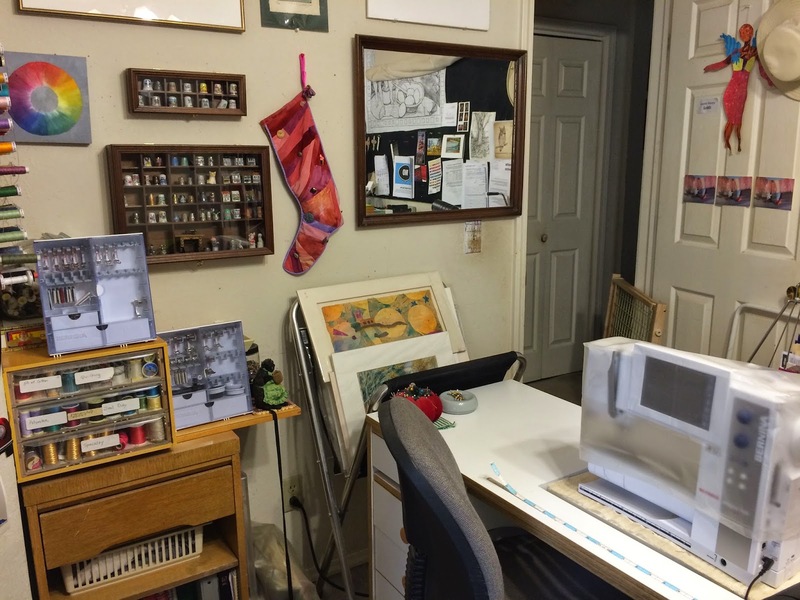 After walking into my newly cleaned and organized studio my husband remarked, " Oh, I was beginning to think that you had sold your sewing machine." 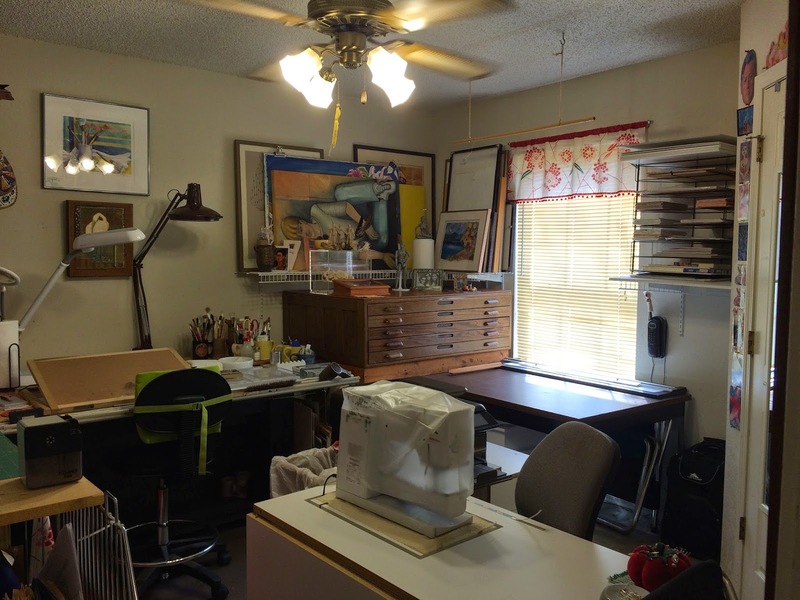 The sewing area has been excavated and is ready for action. 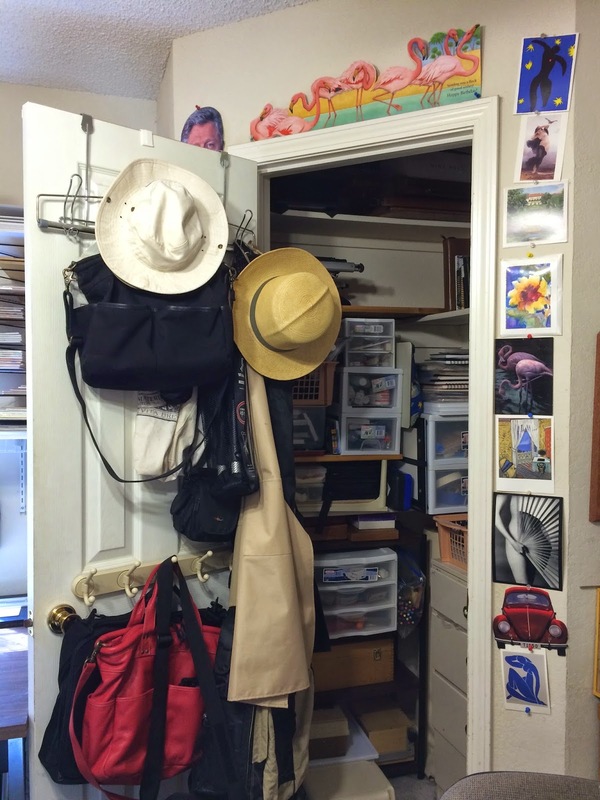 Even the scary closet has been tamed after pulling out three large trash bags full of stuff. Does anyone need a vintage collection of plastic bags? 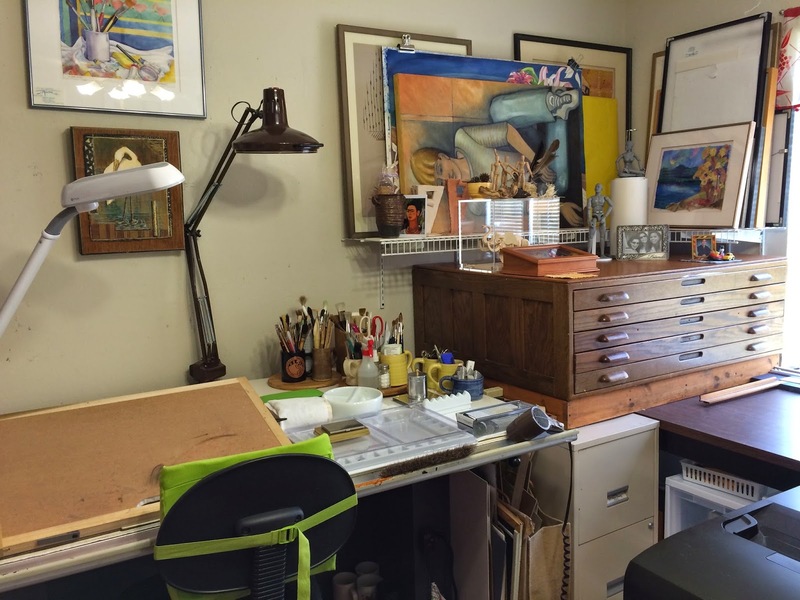 My prized air lift drafting table is ready to go and even those old flat files are cleaned out and organized. 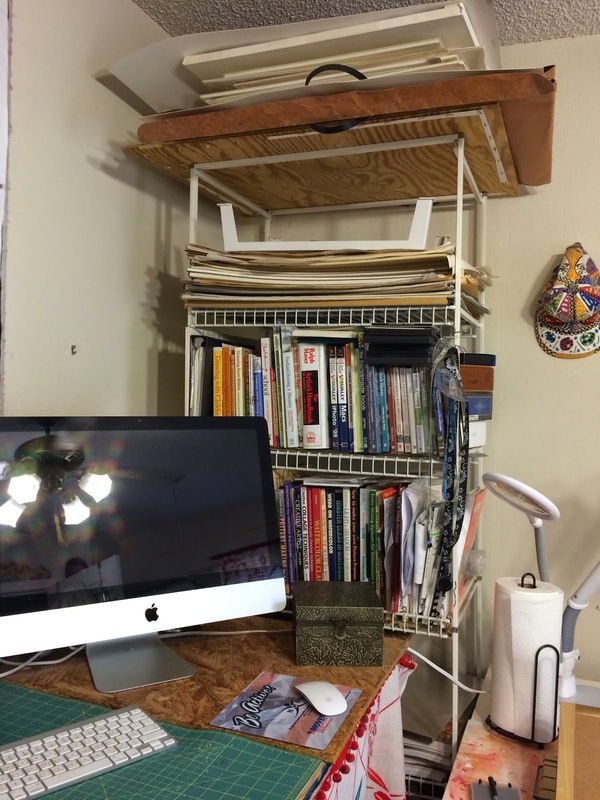 There are still a couple pockets of mess to work on such as my "office area"
and my art book shelves where I tend to to stuff office papers when I am too busy to walk to the end of the table where the office area is. ??? I am hoping that when I clean out that nest of old sketches at the top I will find the original drawing for the Mango Hunters which has somehow gone missing. 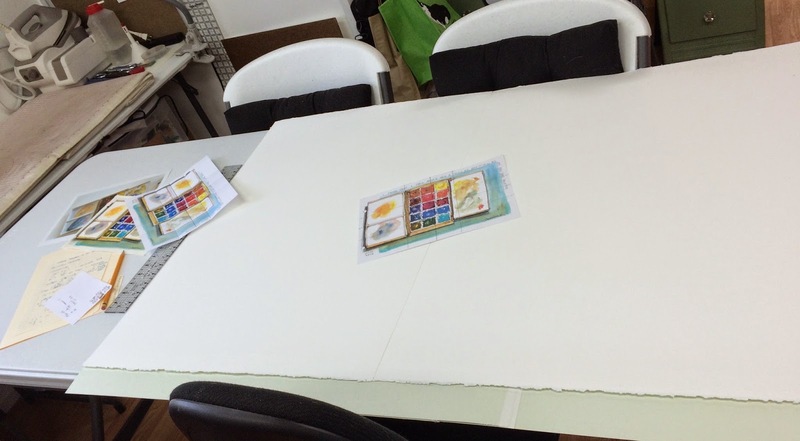 Now that I am cleaned up and better organized I am ready to start working on this Paintbox tapestry cartoon. The paintbox is quite small but my idea is to enlarge it by about 400% for the tapestry. This one should be fun to weave with all those squares of paint. 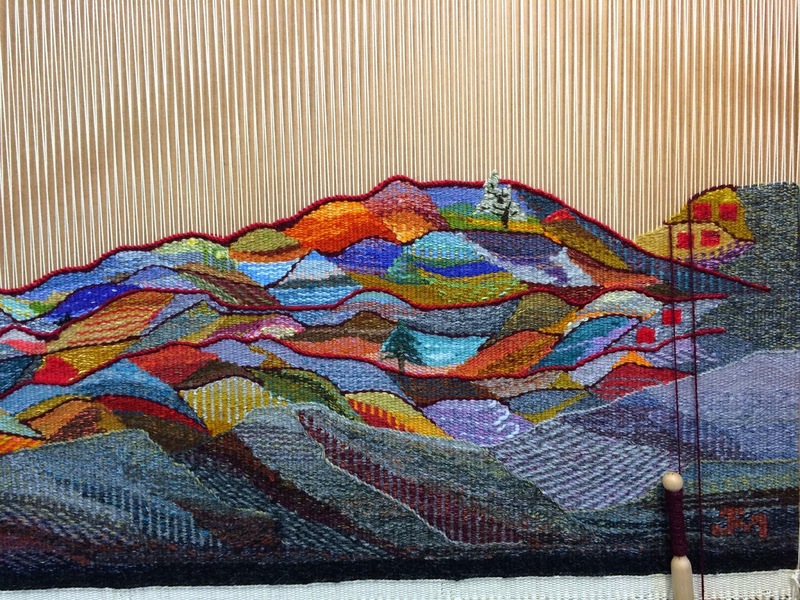 Here is my 2015 tapestry diary as of this afternoon. Somehow with the start of Spring my "Lonely Mountain" has turned into the "Sound of Music". Here is a closer view of the beginning of April. I have been thinking a lot about my trip to Weatherford, Ok to see Archie Brennan and Susan Martin Maffei. I am due to leave early Monday morning and so far I haven't done anything but think about it. Perhaps a day of down time before the packing begins is in order.